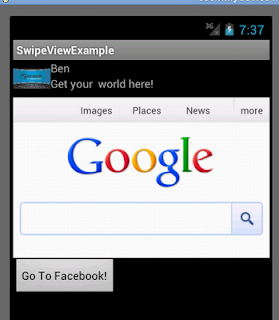 an idea , How to create a Dynamic swipe view in Android. 5-And create a folder name "anim" in res and add 4 xml file for left, right up, down swipe on touch screen. @Manish mLinearLayout.setOrientation(1); what is the 1 and 0 in your code? can you please help me? @Naman I am sorry dear i have not used proper comment in my code..
Hi Thanks for your comment kindly check your email I have sent you the zip code..
Its really helpfull.Can u plz email me the code zip file.My email id is gs_20@rediffmail.com. Thanks for your positive comment but I think every think clear on my blog, I don't think any need for zip code here any way please check your email I have sent you the zip code.. Please try my below post hope it will help you but I am not sure it will fulfillment your requirements. And check your email for other project code.. Please send me zip code file. You can copy paste code from above it's not very complex...Well I have sent you the zip code please check your email! Please send zip code file..